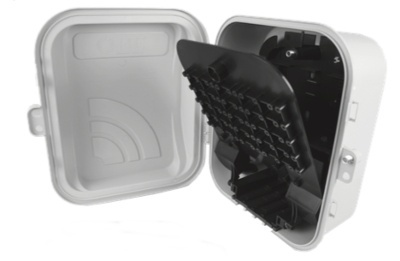 PPC’s residential demarcation enclosures are designed to efficiently house fiber optic ONUs as well as all required RF passives for FTTH installs. The unique design separates the optical and RF layers with a hinged partition cover. This improves the installation efficiency with a single housing and prevents errors and downtime created by mishandling. The internal mounting arrangement allows for a standardized method of installing components. All mounts are the same height and spaced in 1/2” increments per SCTE requirements. The open-ended, self-sealing cable ports at the bottom of the box allow components to be assembled outside of the enclosure making for quicker installations. The fiber entry port also accepts standard duct couplings for up to 1” conduit.